Government officials have a clear message for motorists and residents across the Northeast: Get off the roads, go home and stay there until further notice. They are referring to what is expected be a blizzard of historic proportions bearing down across the region as of Monday night. While Connecticut, Philadelphia and Massachusetts have already declared a state of emergency and called out the National Guard, New York, Gov. Andrew Cuomo is expected to follow suit and said that he may also order everyone to stay off the streets Monday evening as well. Not an easy feat in the city that never sleeps. "What you're going to see in the next few hours is something that hits very hard and very fast and people cannot be caught off guard," said New York Mayor Bill de Blasio. In addition to private vehicles being banned from New York City streets as of 11 p.m., the Mayor also warned that mass transit options will eventually shut down as the night wears on. "I want everyone to understand that we are facing -- most likely -- one of the largest snowstorms in the history of this city," de Blasio added. In case anyone has trouble believing the politicians, the National Weather Service isn’t one to exaggerate and they’re also issuing a serious warning using terms such as "life-threatening" and "historic" to describe the storm as well. In other words, folks across the Northeast really do need to heed the warnings. The worst of the weather is expected to hit late Monday evening and drop up to 3 feet of snow on Boston and New York before it ends Tuesday. Freezing rain and strong wind gusts are also expected to reach up to 55 to 65 mph. The blizzard and winter storm warnings have been also issued from Maryland all the way up through Maine and into Canada, putting up to 58 million people into a deep freeze. 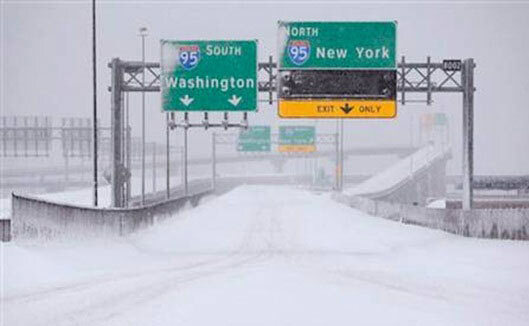 "This is going to be a lot of snow, no matter how you add it up, so we are going to be challenged," New Jersey Gov. Chris Christie said. Between 50% and 70% of flights have already been canceled Monday at New York area airports and more flights are expected to be cancelled on Tuesday. American Airlines also said it would suspend operations in Philadelphia, Boston and New York late Monday afternoon. Massachusetts Governor Charlie Baker issued a serious warning to motorists at a press conference on Monday, saying that driving will be "virtually impossible" during the storm. "Please stay off the roads. Everyone should expect impassable roads starting at midnight tonight. We are also preparing for flooding along the cast," Baker said. For the areas issuing a travel ban, the only road travel allowed will be emergency vehicles, aid workers and vehicles necessary to maintain critical private sector facilities, services and operations, and to deliver or support critical private sector services and supplies in critical infrastructure sectors such as energy, fuel, financial systems, and the provision of critical commodities. This also includes travel to support business operations that provide critical services to the public, including gasoline stations, pharmacies, food stores and hardware stores. I would rather drive in that, then the everyday traffic. It don't even look bad. Hope it hurts the place!